The natural lake of warm muds is the perfect result of the balance between the intervention of man, and nature. The artificial human intervention has not changed anything of an already existing natural heritage; on the contrary, works of removal of the soil’s crust, did in the 60s of the twentieth century to create a volcanic lake , permitted a man to better overwork the properties of the place, without artificially changing its original qualities. The volcanic lake has emissions of water from lower slope with a presence of vapours of sulphur, anhydrite, metal saults, and natural radioactivity. It seems impossible to manage to immerge into the waters of a place where the strong smell of sulphur is perceived at the distance, but the landscape’s suggestion and benefit effects of volcanic muds give a sensation of great well-being, making the experience of immersion into muds unique and unforgettable, if considered as a souvenir of well-being, relax, and enjoyment of all the senses. Among rocks and in muds there are breathes which the crater makes; the immersion into the natural lake of warm muds of Vulcano is really the realisation of the symbiosis between man and nature. The continuous emission of these breathes creates mud of clay, whose elevated acidity and the elevated concentration of sulphur do not permit germs’ creation. Muds’ bathes do not only produce a sensation of a psychophysical well-being; on the contrary, they are real therapies. In fact, they are advised those who suffer from breathing and skin diseases, and those of the human musculoskeletal system. The benefits concerning the human musculoskeletal system’s diseases refer to the analgesic and the relaxing action of mud, useful for the treatment of bursitis and tendinitis. For a mud bath, concerning the post-trauma of the bones, it is always recommended a doctor’s opinion. In case of dermic pathologies, or more simply for those with a type of dry skin, there are some useful and needful advices. Mud must not be applied on one’s face by whoever as if it were a beauty mask. For example, those who have dry skin will not obtain the same benefits of who has more oily skin; the doctor’s advice is then indispensable, in order to avoid the aggravation of latent dermic pathologies, or those present in a light or a not serious form. The sulphuric emanations are also a perfect treatment for breathing pathologies. A natural way to do aerosol is to inhale the emanations at the safe distance of 50 cm from geyser. 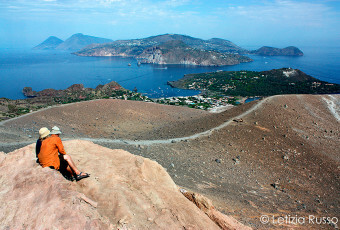 In conclusion, the natural lake of muds of Vulcano, is not only a unique scenery from landscape’s point of view, but is a kind of “natural clinic” for the treatment of body and soul. Both physical and psychological benefits are achieved, if we consider that treating your body in such a special and evocative place , you obtain an immediate sensation of well-being and relax. 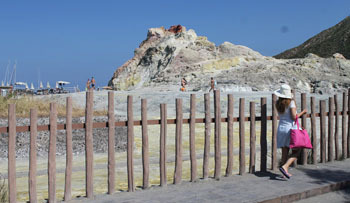 In short, the muds of Vulcano are a Spa in the open air, a natural thermal centre.